No matter how hard I try to keep things organised and sorted, as a family we seem to accumulate more and more things. The garden is no exception, and our once under utilised garden shed is now bursting at the seams. It attempts to house all the diy tools, gardening equipment, scooters, 5 bikes, the lawnmower, sun loungers and so on. Nothing is easily accessible and consequently it’s a constant mess. Does anyone else have this problem? We’ve been wrestling with how to improve the situation. 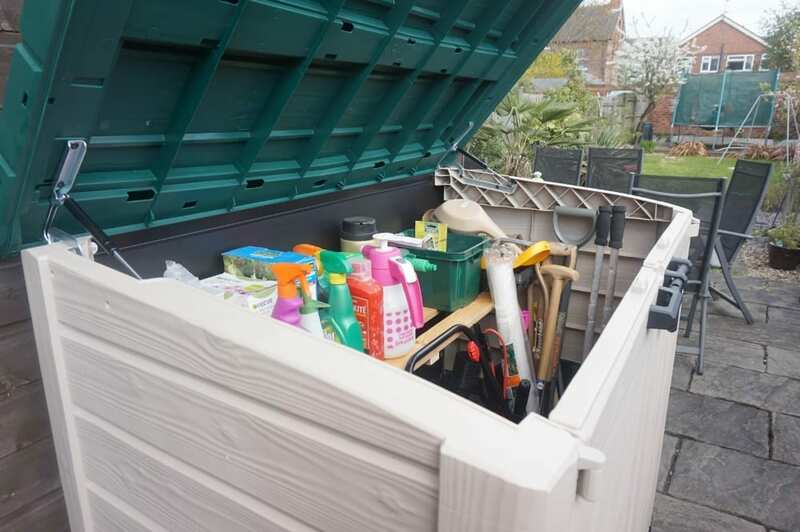 With #ProjectAttic almost underway it felt like too much to tackle the garden as well, relocating and possibly buying a bigger, new shed so when Keter contacted me, asking if I’d like to showcase their products, the timing couldn’t have been better. Keter is the supplier that has all those clever plastic storage units that you see in places like Argos and Amazon. They make and ship all kinds of shapes and sizes to suit all kinds of garden storage requirements. 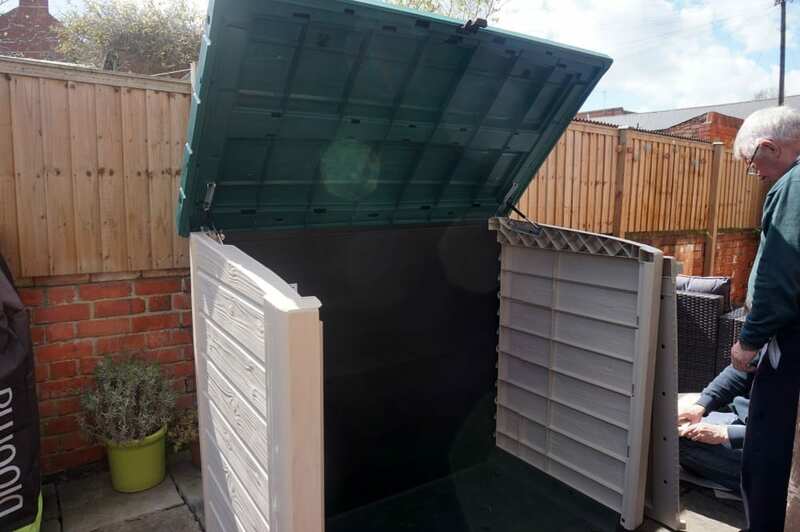 After looking at the choices, we opted for a Store-it-Out Max – a horizontal shed unit ideal for garden equipment or wheelie bins. I’ll be honest and say we’d never considered one of these kinds of sheds before; I wasn’t convinced on the way they looked, but after seeing ours in the flesh I’m really impressed. 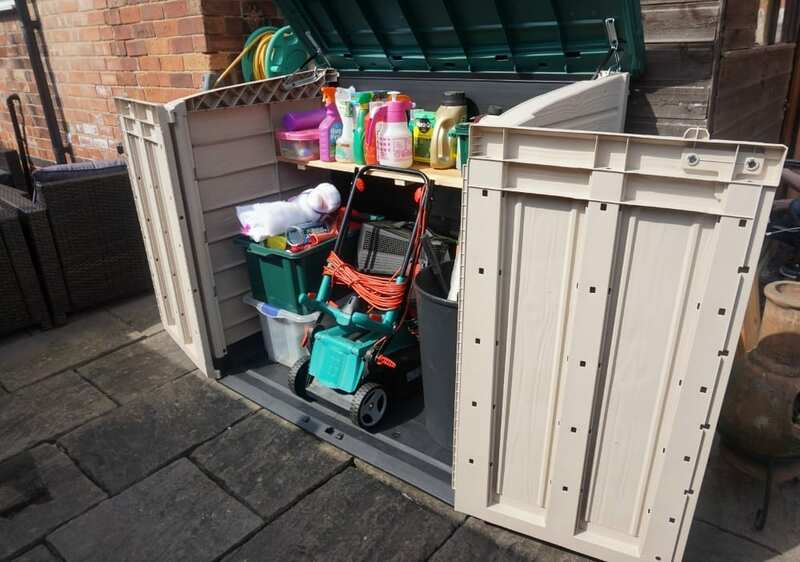 The Store-it-Out Max has a small variety of colour options, is maintenance free and lockable, has a sloping floor for easy wheeling, and an easy open lid with hydraulic pistons. It arrived in a large, flat box and took my Dad and Husband about 30 minutes to assemble. No problems there at all. Then the fun really began when we tried to decide how to fill it. We knew it needed to be an overflow to our current shed, to ease the burden on that storage, but it needed to be sensible too. Finally, it’s housing all our gardening equipment and the children’s garden toys and tennis rackets. There’s plenty of space for all the planting gear, garden sprays, hoes and spades as well as the lawnmower and my array of plastic pots. The girls can easily access their garden toys and skipping ropes and even the box of bubble paraphernalia has pride of place on the shelf. The shelf is actually our own creation and it’s probably a shame that the unit isn’t shipped with one. If you do want to use it for general storage like we do, you’ll probably get more from the space if you insert a shelf. You can buy shelving units and kits from Keter but I didn’t realise this when I ordered, that it would be extra. Still, just a few planks of wood later we managed to create our own. I’ve been out this weekend, planting up the sweet peas and tomatoes, weeding and mowing the lawn, and the Store-it-Out Max is perfect. It’s so easy to access everything now. I guess there really is no excuse for not mowing the lawn in the future! The product was gifted, but all the opinions and comments are honest and genuine. You can see the full range of Keter products on their website. This particular shed is available from Amazon and Argos for around £120-£150. Love the storage facility, I like the fact that you can easily access the items with organised shelves. I think my spring clean is long over due which has been partly delayed by decorating project that is yet to start. 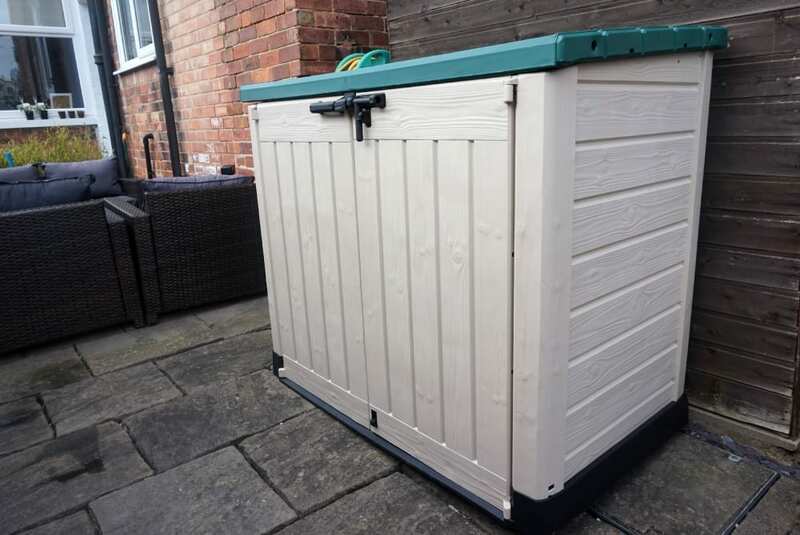 We’ve just moved from a house with a shed, conservatory and garage to a house with just a garage so we are just looking for some outdoor storage similar to this. It certainly looks like you can fit a lot in and I shall be showing to the hubby later. Great addition of the shelf. Thanks for this great post Jen! we just got one of your rattan style storage boxes! Very nice and useful for those extra bits you have laying around. I use if for outdoor toys mainly. That is a very clever way to store your outdoor equipment. To think, people complain that they need a big enough garage to store their things in. Great Idea! 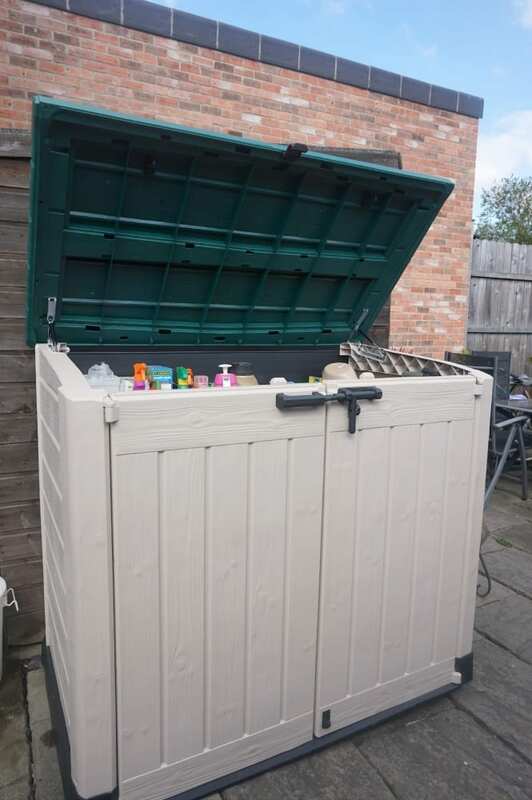 Wow – this post was really helpful and gave me some great ideas about garden storage. In my blog I tend to focus on garden design, plants, and the more aesthetic side of gardening, but this was a great reminded that there is more to gardening than pretty flowers and a water feature. A family garden has got to be a place for fun, not just a place to be looked at from the kitchen window, so great tips like this one are good to have and too often overlooked. Thanks for the great article! lovely post there. really informative and enlightening. 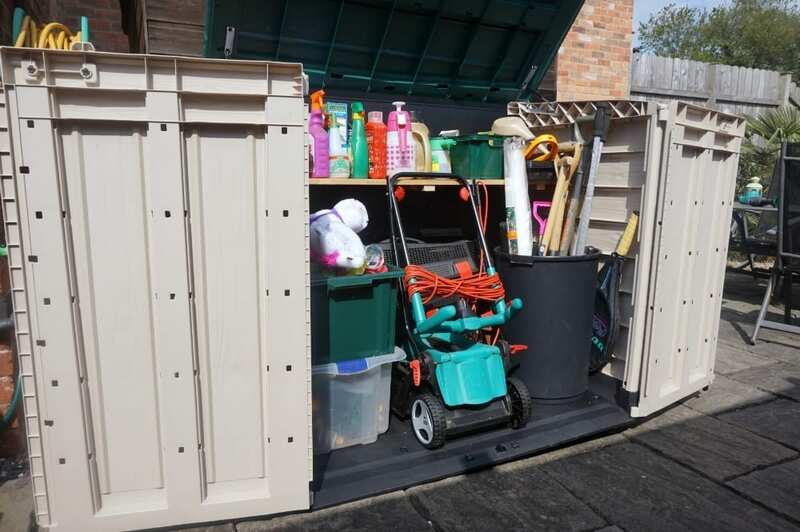 Increasing outdoor storage space is not only a great way to stay organized but also helps make things look more appealing, especially if you are looking to sell your house fast. Very informative. Thanks for sharing will be sending to a couple of our clients! This is a great article on storing your outdoor equipment. I thoroughly enjoyed reading through this. Thanks a lot for the step by step posts Jen! Very informative article. Thank You for sharing Such a Great Article With Us. Very nice post.Thank you Jen..